People love apples. Juice or sauce, candied or raw, all by themselves or combined in a salad, apples can be enjoyed in countless ways. And we haven’t even started in on the kinds of apples! With over 100 varieties grown in the US alone, there seems to be an apple for everyone. And so it is with Marketing… there is an a la carte feel to marketing that means that almost anyone can dive into this genre of business and come out with a style, type, or component that suits their perceived needs. Graphic design, web development, SEO, copywriting, social media management, photography, videography, and motion graphics… all of these are unique ‘apples’ to choose from. And they are great! But given all of these quality options, it can also be daunting to know what your business needs in order to execute smart marketing practices for the immediate and long-term needs that always arise. And unlike the apples of this metaphor, marketing practices are not cheap, so it’s unlikely that you want to spend your annual budget trying each component out until you find the right fit. Fortunately, there is a solution to the myriad confusions of marketing executions. … on Thanksgiving Day, with a scoop of vanilla ice cream, walked into a room of hungry, apple pie-loving folks! There is a recipe to apple pie. Ingredients must be bought, and the oven preheated. You have to make the dough that becomes the crust. The pie filling has to be made too. And then timing matters, because we all know that apple pie is best served somewhere between warm and hot! And if you’ve never made the recipe before… you need to call your mom. At least, I do. And again, we look to strategic marketing. This is not just a bunch of apples stacked on top of one another. This is a component of marketing that takes a product or service, collects all of the information that is true about it, and makes calculated decisions to determine the right audience, an attractive delivery, and the right ingredients. And in many respects, that is the first step in the strategic marketing process: Knowing. Knowing what you can do, who wants that product or service, and how to get the right product into the right hands with as much integrity and sensibility as can be accomplished. And if you think that ‘knowing’ comes easy, beware. As a kid, my great uncle would send us to the back half of his land, down a long gravel road, to search for gold. And man, as a 10 year old kid, finding gold was the coolest thing. It was everywhere. I was sure that Uncle Bill was the wealthiest man in the world, to just have gold lining one of his driveways. But my affection for adventure and gold-mining died when my dad wouldn’t let me take my treasures home. “It’s not real gold, son. It’s pyrite. Fool’s gold. It looks like the real thing, but it’s just a rock.” Hopes… dashed. The curse of knowledge that afflicts so many business owners, entrepreneurs, leaders and marketing directors is that they know enough. But sometimes, enough is not enough and, as Jim Collins wrote, “good is the enemy of great. And that is one of the key reasons why [there is] so little that becomes great.” All too often, we settle for ideas and ideations that are good enough. We have a plan, but we aren’t prepared for the challenges ahead. We empty the purse on marketing components, but we don’t see the need for any kind of strategic marketing process. And that desire to do the first thing fast makes a lot of sense. Business leaders are busy. Time is a commodity. And buying the cheapest, best-you-can-find solution is a common and constant business practice. But the business habit of hemorrhaging dollars on random creative solutions, simply because you haven’t invested in a sound marketing strategy no longer makes sense. So what is a business to do? The answers are diverse, but none are overly-complicated. Know that you just don’t know. As the Director of Strategic Marketing with Olive Group, I get the terrific opportunity to spend a lot of time with wonderful business leaders in all kinds of industries, who are all coming to grips with one clear truth about marketing: They don’t get it, but they know they need it. And there is a lot of strength and clarity in knowing your blind spots. I have never lead a successful strategy session with a client who thought they didn’t need our help. What do you need: Marketing or Strategy? I have already outed myself as a marketing strategist, so you might not be shocked to read that I think all businesses need marketing strategy. But maybe I’m wrong. So try a survey of your leaders, employees, and clients. Ask them these simple questions: Why do we do what we do here? How do you gauge business success? And once you’ve looked over what you and your team say about your business, discuss some initial strategy. Do you know who you want to be doing business with? Do you know who is looking to buy what you sell or do? Does your online, social media, and advertising presence reflect what you believe about yourself? If not, then you need marketing help. And if you have no idea how to get there, you need marketing strategy. Your business is valuable. On sweat equity and financial investment alone, many leaders have dedicated a life’s work to making their businesses successful. And the price of failure is often very steep. But I truly believe that engaging marketing through a sincere strategic marketing process can save money, stress, and a lot of time, no matter what you do. I think of it like that scene in Apollo 13, where the astronauts realize that they will not touch the moon, and if they miscalculate any part of their unorthodox journey home, they could miss the whole planet and be lost to space. But they saw the problems for what they realistically were, made the right calculations, and asked for a lot of assistance back on Earth. They controlled what they could control, sought help beyond their expertise, and then focused on the executions they needed to follow the strategy through. Otherwise, they would have been guessing on how to hit a 10 mile wide area on Earth, from the Moon, going around 300MPH. And that’s what you face as a business leader today. Hopefully, you can see that you have a problem. And there are people on the ground, waiting to advise you on the safest way home. You don’t have to heed my advice. You don’t have to listen to a word I’ve said. 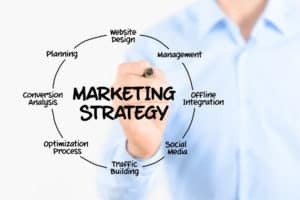 But if you knew how to lead your business through the strategic marketing process, you’d be doing that instead of reading this blog on what marketing strategy is. So let us help you land that plane. You’re the expert in your field, and we are the experts in ours. How can we help? And did you know that we are recognized as a top Marketing Agency on DesignRush? And see us listed on their list as a content marketing company. We’re using wordpress and it works great for us!